The Item Type displays here in the list. 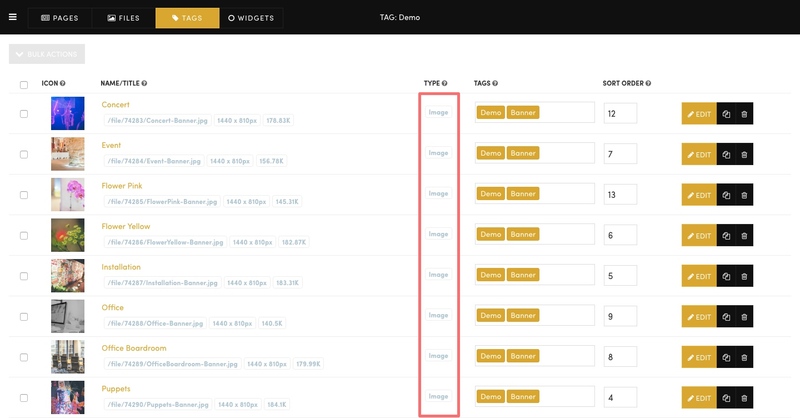 In the Tags section, you can filter your search by all items types, including all Pages, Images, and all File types. How does the 'Icon Preview' assist when Tagging in the Tags area? How does the 'Item Name' assist when Tagging in the Tags area? How does the 'Tags List' assist when Tagging in the Tags area? How does the 'Sort Order' assist when Tagging in the Tags area? What do the 'Bulk Actions' do when Tagging in the Tags area?